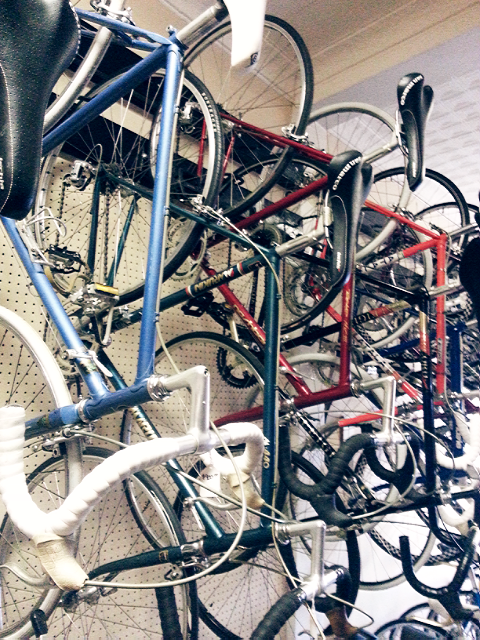 The past weekend, Felkerino and I made a field trip out to Arlington, Virginia, and peeked our heads into the new bike shop known as The Old Bike Shop. We stopped by late in the day but Larry, the owner, was more than willing to stay after hours and chat with us about his recyclery. 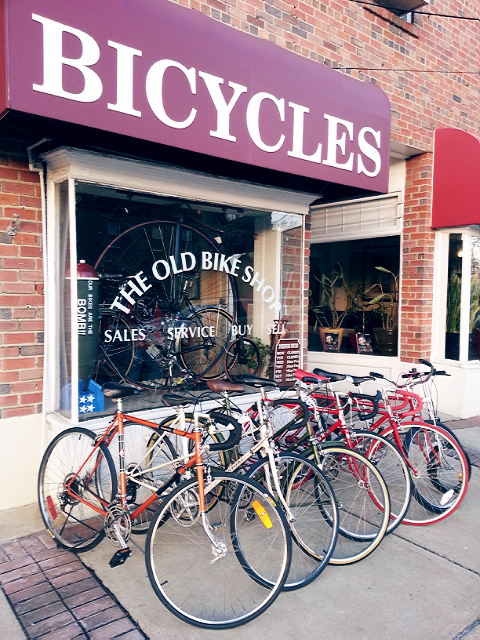 The Old Bike Shop had its start at the Arlington County Farmers’ and Flea Market and now is a brick and mortar business. As the term recyclery suggests, the shop does not sell brand new bikes. Rather, it sells previously owned bikes that have been fixed up (depending on their condition) and made road ready. Larry’s enthusiasm for bikes is evident, and his mission is clear. He aims to sell affordable, reliable, and attractive used bikes to people who want a bike for transportation. 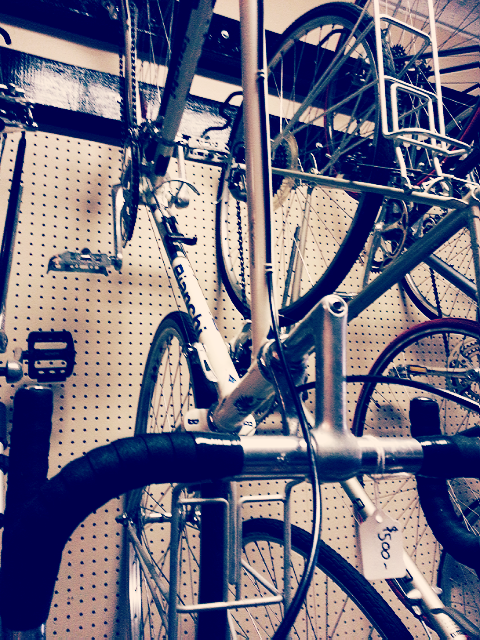 There were a variety of mountain bikes, touring steeds, and a few mixtes on the shop floor. 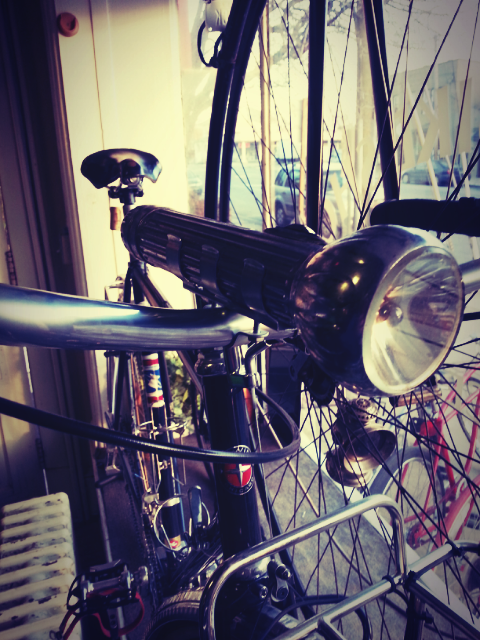 His affection for steel, lugs, and Japanese frames shows in the shop’s selection. 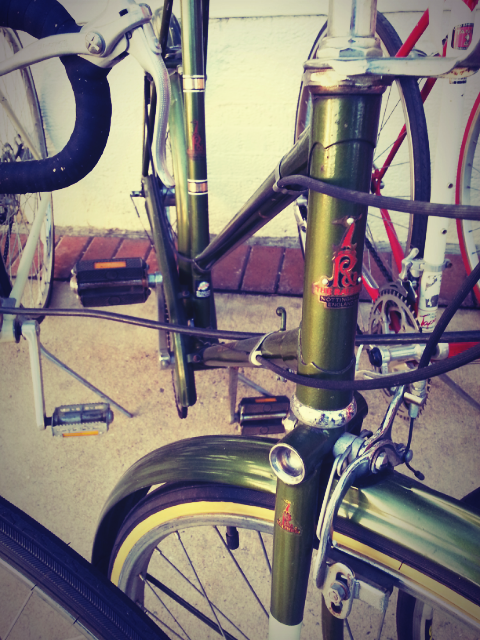 One of Larry’s Bianchi touring frames was calling my name. Beautiful color scheme! Unique and classy! Fully built! My size! $500! However, I could not justify the purchase of another touring bike and had to leave it behind for some other lucky purchaser. The shop itself is also attractive, with hardwood floors and cool high ceilings. Plenty of space for bikes. 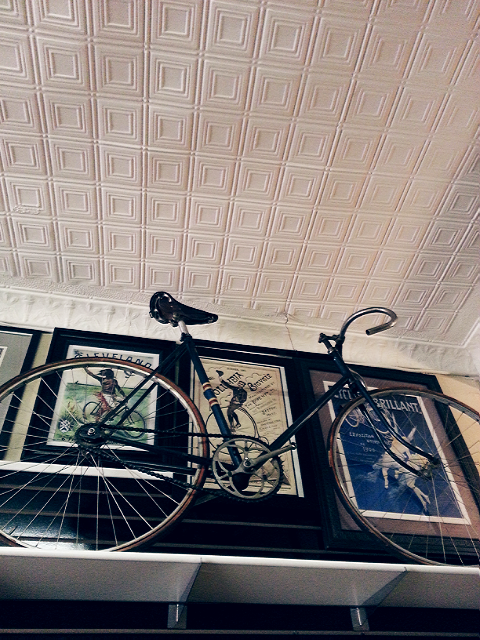 Larry has used some of the space to display bikes from his personal collection. If you ever want to see a chrome Paramount or a pretty old Alpine touring frame, among others, go ye to The Old Bike Shop! 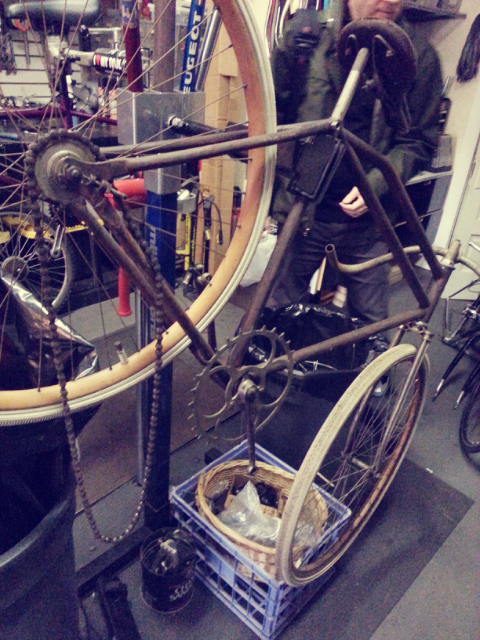 In the bike repair zone, Larry was working on an old track bike. I don’t recall the bike’s vintage or what he planned to do with it, but I was fascinated by the fork, the aesthetic of the crank, and the old wooden wheels. I’ll be back to The Old Bike Shop. Larry’s selection of bikes is ever-changing and his knowledge about bikes is impressive. Best of all, he has a way of making you feel like riding a bike is the greatest pursuit in the world. I bought my.mountain bike at a recycling bicycle shop in 2009. I love it and that it’s recycled. The recycled bicycle shop here in Brisbane builds beautiful machines too. I am totally into the recyclery idea. 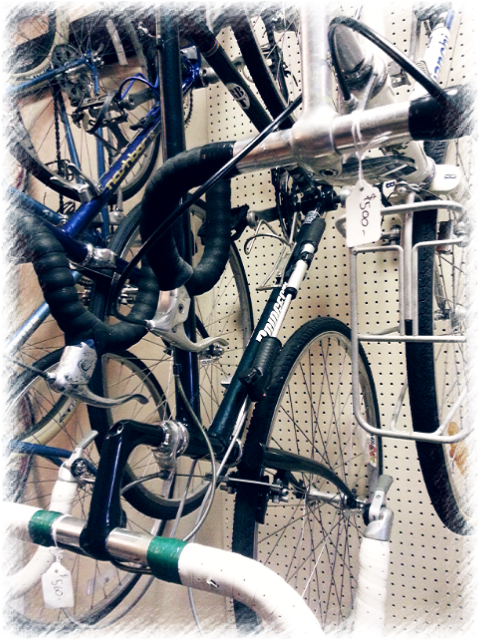 There are so many good used bikes out there, just waiting to be fixed up and prepared for a new rider! That bike shop looks so cool! I’m always looking for my next bike. Whether good or bad… so am I! You would definitely like this shop, Tim! If I am ever down that area I will surely stop in. I live sort of nearby, but have yet to stop in (I-395 is a big bike obstacle in Arlington, and I’m on the wrong side of it). Definitely need to stop by to ogle, but do they also sell used/vintage parts? I did not see any vintage parts on display, but I would think if you had a part in mind, you should give Larry a call and see what he has. It looks like he might have hidden treasure there! Second (or more) hand shops are not so easy to find here in Spain, at least that kind of shops which add extra value to the things they sell, as the one you show in this post… snif, snif. By the way, nice post. That’s too bad… You’ll just have to come to D.C. some day :). Can’t believe you got here before I did – and I live less than a mile and a half away. So, pushed by this post, I walked up there late yesterday (Sunday) afternoon. I’ve talked to Larry at the Courthouse market, too (though I’m rarely around when it’s open!). That Bianchi – not even close to my size but would be sorely tempted if it were. He was working on a customer’s bike so I only chatted a bit with him. But based on what he had at Courthouse, I think he has a lot more mixtes in his stable of old bikes. 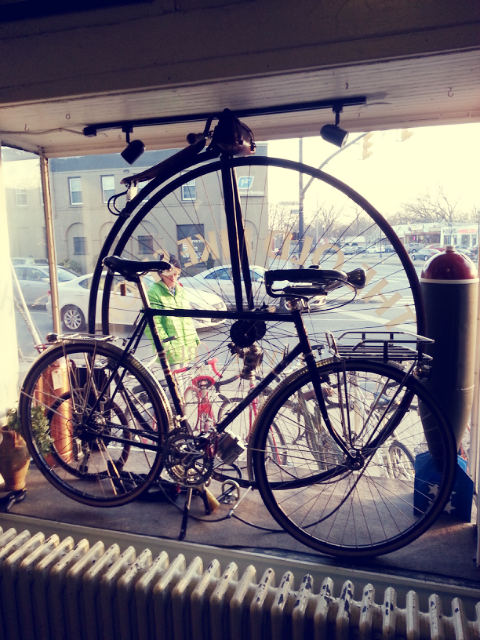 Great collection (there was an interesting National Bicycle Co. bike outside) and I hope he succeeds – though I wouldn’t want him to impact Papillon’s business, because I really like Bailey (who is also an old bike afficionado and good mechanic). Looked like Larry sells mostly bits and pieces of new stuff to keep bikes on the road and will be doing repairs as well. This is a fantastic idea! We bought my husband’s bike back when WABA had their used bike sale and it’s such a great way to get someone into it without a huge layout of cash. I really like that he fixes them up first, which is an obvious advantage over the bike swap.